In running high-profile consumer and B2B public relations campaigns over the years, we’ve learned some important tricks for making surveys work harder. 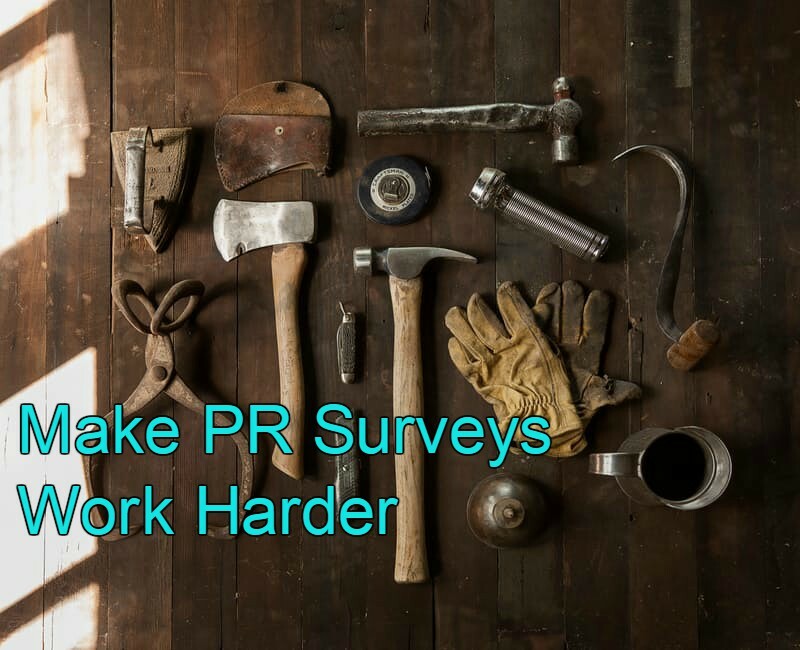 As any good PR person knows, a well-designed survey can help increase earned media exposure and sharing of branded content. But a survey is an investment, and outcomes can be unpredictable. Here are some tips you may want to incorporate when drafting your next survey. Pick a provocative topic. Let your own finely tuned media consumption habits guide you towards what a timely and relevant topic might be. Do research to determine that other recent surveys haven’t already covered the same ground. Then, build questions around it that would make good fodder for reporters. In our experience, even broad topics that have already been surveyed can work if there’s a fresh twist or a focus on a narrow aspect of the them. Even if the topic is large, packaging the results in an arresting way can draw attention. For example, surveys about our about the coming election might have seemed redundant during our poll-heavy and lengthy campaign season, but the “top American fears” hook for one annual study was not only well designed, but well packaged and the result was truly newsworthy content. Keep the results you’re looking for in mind. Don’t mix in unnecessary questions or choices that could end up clouding your data. Sometimes it’s helpful to write a press release lead first, to see in black and white what an ideal headline might be. Before you even develop your questions, think about what the desired outcome might be based on your client’s expertise and goals. Working with The NHP Foundation, we hypothesized that millennials are putting off home buying due to crushing school debt and other factors. Trends and public-domain data seemed to back our theory, so we developed relevant questions, and the media found our results compelling. Be thoughtful in constructing questions. Write questions clearly and consistently, so all respondents will interpret them the same way. Use formats that are most conducive to the question you’re asking. For example, when asking respondents to gauge how strongly they feel about a given topic, provide just enough choices to include all possible respondent answers, but not so many as to overwhelm. And, avoid yes and no questions except when filtering. They don’t tend to reveal very much. Mine results for the “sexiest” news. The best surveys reveal two or three unexpected and newsworthy nuggets. But even if results yield only one, if it’s truly salient, it can grab press attention such as this survey which found a majority of Americans believe fake news when they see it! Once you’ve settled on your headline, bolster it with client quotes as well as external expert quotes to help build credibility. Don’t stop with a press release. That is only the beginning. Make your survey work harder by drafting an article based on the results or creating an infographic with the most startling findings. Pitch your client to appropriate media to discuss the survey in a greater context. Use the results as a starting point for an industry white paper and make it as shareable as possible. Slice and dice the relevant info for social media mentions for miles! Put an even longer tail on survey results. Even if your findings aren’t enough for a standalone article, work with reporters to position the results as worthwhile data for other articles the publication may be doing down the road. Survey data is good for a year, at least. And, most often the publication will credit the organization for supplying the data. In the best circumstances, you will repeat the survey annually and press will subsequently include YOY survey results in related press releases and media pitches.